I'm currently on an extended leave from being gainfully employed, due to ill health. I'm spending my time these days going to plentiful medical appointments, figuring out how to live a good life with chronic illness, and getting back to my roots of being a creative person. A big part of my life is doing art and sewing, as well as chronic illness and disability advocacy. 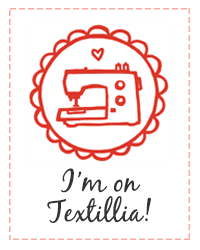 My partner Bruno and I live in Vancouver and run an online community and sewing pattern review database called Textillia, for people who love sewing, quilting, and embroidery, similar to the ever popular knitting website Ravelry. Didn't you used to Drupal? Yes! After finishing my Masters in Health Geography at SFU, I ended up working in the tech industry. I worked primarily with software called Drupal, which I'd been dabbling with since around 2005 (when I used it for a website for my short-lived craft business, the now defunct City Girl Designs). From 2007-2012, I worked as a client manager, site builder, and project manager for a couple of web development companies that build web platforms for organizations and non-profits focused on social and environmental change. I also did a lot of event organizing for the local Drupal community, and was co-lead of Documentation for the Drupal project. While I'm no longer involved in the community, Textillia is built using Drupal and Bruno continues to contribute back through his work on the project.